The assembly of the Jellyfish, while somewhat daunting at first, is actually quite easy. 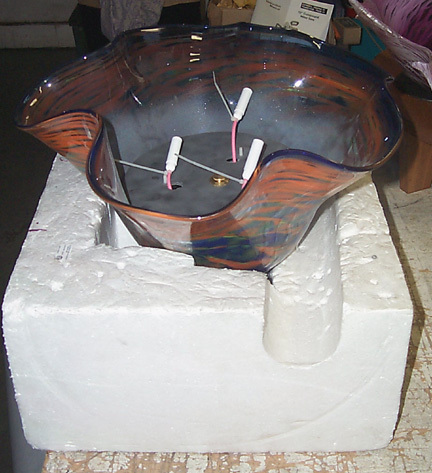 The simplest approach is to invert the body of the Jellyfish and set it down in the styrofoam container in which it was shipped (or a cardboard box with towels or newspapers crumpled up inside to keep the body stationary). 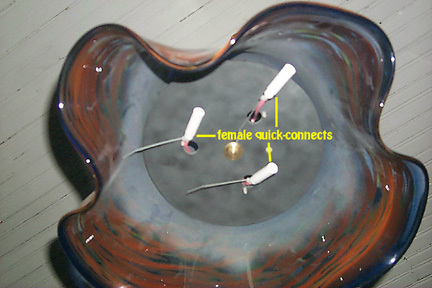 In this position, one can see three female style quick-connects protruding through the three holes in the plexiglas circle. Next to each of these three holes, one can also see a nylon screw with a nylon cap nut penetrating through the plexiglas. 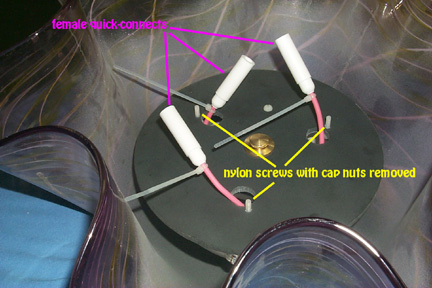 First, remove each nylon cap nut from each nylon screw. 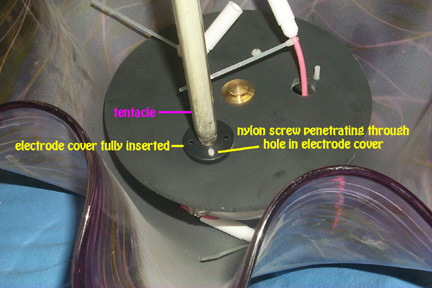 When one examines each tentacle, it can be seen that on one end there is a male style quick-connect and a rubber electrode cover with several holes in its lip. 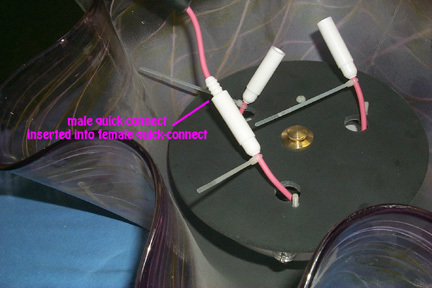 The male quick-connect of each tentacle is to be firmly inserted into the corresponding female quick-connect. 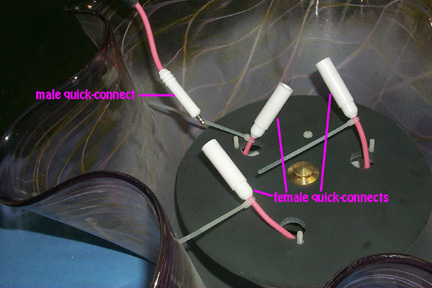 After the quick-connects are coupled, the wire is fed gently back inside the hole in the plexiglas until the rubber lip of the electrode cover is abutted to the plexiglas. 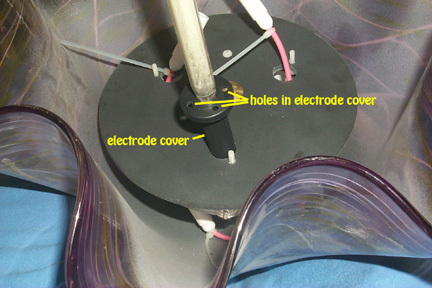 Note that the small nylon screw protruding adjacent to each of the three holes will fit through one of the holes in the lip of the electrode cover. 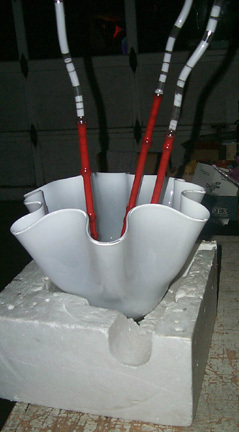 There are several holes in each lip allowing each tentacle to be placed in a variety of positions as desired, based on the overall configuration of the three tentacles as a whole. 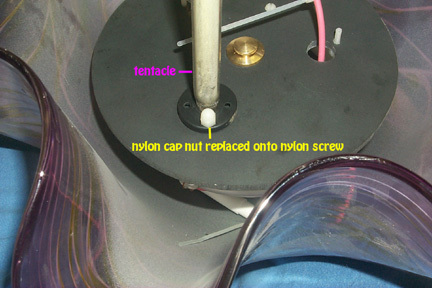 Firmly holding the tentacle adjacent to its electrode cover, gently push the lip of the electrode cover over this screw and replace the nylon cap nut onto the screw finger-tight (not too tight!). 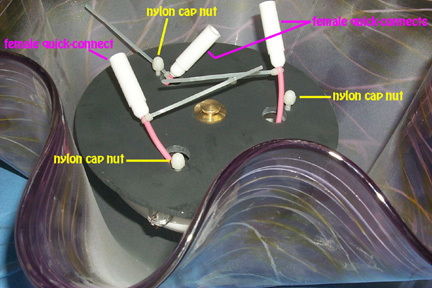 When all three tentacles are in position with the nylon cap nuts replaced, the Jellyfish is ready to hang. Hold the body of the Jellyfish in one hand, supporting it with the other hand in the center of the plexiglas disc between the tentacles. Be careful not to grab the rim of the glass Jellyfish body as the glass here may be thin and can break. At the top of the Jellyfish body is a brass hook that will allow it to be hung from a chain or an acrylic-coated steel wire. 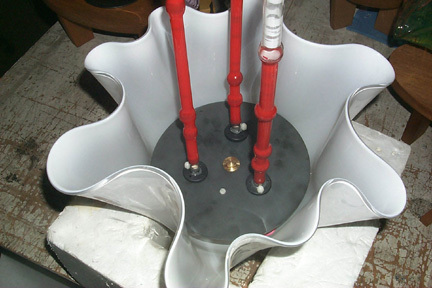 Once the Jellyfish is hung, attach the quick-connect from the AC adaptor to the quick-connect at the top of the Jellyfish next to the brass hook. When this connection is established, it is time to plug in the AC adaptor and enjoy the Jellyfish sculpture!